It’s 1974 and bell-bottom pants and platform shoes were in fashion…unfortunately. It was also the year that an odd federal law was passed that now governs $29 trillion in U.S. retirement plan assets. The law was ERISA or the Employee Retirement Income Security Act. And notwithstanding the word “retirement” in its title, it also covers all employer-sponsored health plans and most other employee benefit arrangements. The bell-bottoms and platform shoes may be gone but the growing impact of ERISA and explosion of class action litigation against employer plan sponsors in recent years is something that boards of directors, officers and other company executives should be concerned about – because under ERISA they may be personally on the hook for any plan breaches as fiduciaries – and often D&O insurance isn’t going to protect them. The costs of ERISA litigation can be staggering. The 10 highest ERISA class action settlements in 2017 totaled nearly $1 billion. With courts increasingly siding with plaintiffs in these cases, there appears to be little hope that the trajectory of ERISA litigation will reverse. At the same time, plaintiffs are exploring new avenues of attack under employer sponsored health plans using the same ERISA fiduciary arguments developed over the last 45 years on the retirement side. It’s simply not enough that employers keep compliant with the Affordable Care Act and Internal Revenue Code (both of which have provisions embedded in ERISA amongst eight other federal laws including COBRA). They also need to focus on their fiduciary obligations under ERISA because that’s the focus of these class action lawsuits. Historically, ERISA litigation has focused on the duties, responsibilities, and actions of retirement plan’s fiduciaries—typically, the board and company executives. Under ERISA, those fiduciaries are charged with one main objective: to act solely in the best interests of plan participants. Class action suits against companies have alleged that fiduciaries have violated that rule by, for example, making imprudent decisions regarding investment choices, or failing to manage plan documentation or monitor people hired to carry out plan duties. In recent years, ERISA fiduciary litigation has increasingly focused on excessive plan fees and expenses. There has been an increase in class action litigation by plan participants who are basically saying that their employer’s 401(k) plan charged them too much—and the plan fiduciaries should have shopped around and found better deals. Those can be huge lawsuits. In some, the employer has ended up being on the hook for reimbursing retirement accounts for millions—sometimes hundreds of millions—of dollars. Often, businesses will carry directors and officers (D&O) liability ERISA fiduciary insurance as a hedge against personal liability exposure. However, those policies might not be sufficient when it comes to ERISA fiduciary litigation. D&O policies may not cover ERISA-related liability at all, or there may be special provisions, such as requiring executives to get annual fiduciary training. Even if there is coverage, it might be woefully inadequate compared to the size of the plan or the risks involved. The United States spends approximately $3 trillion a year on health care, making the oversight of company health plans an attractive target for plaintiffs. Such plans have been covered by ERISA since it was passed, but over the course of four decades, there has been comparatively little litigation on that front. However, that has been changing with rapidly rising health care costs and the implementation of the Affordable Care Act. These factors prompted employers to collect cost-sharing premiums from employees or become self-insured, thus creating a new target for ERISA fiduciary breach actions. The plaintiffs’ bar is now arguing that those employee premiums and other costs, such as co-pays, types of coverage, pharmacy rebates, should be considered protected ERISA plan assets, and that every decision a plan sponsor makes with respect to use of those plan assets is a fiduciary decision. 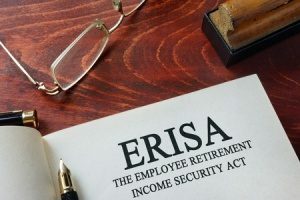 Fiduciaries overseeing health plans have to be exceptionally careful to follow the same golden rule that they follow with retirement plans under ERISA, i.e., to ensure what they do is solely in the best interest of participants. Looking ahead, fiduciaries’ decisions about monitoring costs and who they appoint and hire to administer health plans will be important drivers of ERISA litigation. The best protection for employers is to demonstrate that they have undertaken regular and in-depth compliance reviews of retirement and health plans. That means providing proof that the plan sponsor has reviewed plan documentation for compliance with applicable law, undertaken review of governance and delegation of authority structures, provided external fiduciary training, and demonstrated regular monitoring and benchmarking. In general, companies need to make sure that their fiduciaries perform due diligence and follow clear decision-making processes. With the increasing emphasis on personal liability, companies also need to make sure that people in those roles are qualified to act as fiduciaries—a factor that may be getting more scrutiny. In September 2018, after losing a class action lawsuit against New York University over the handling of retirement funds, the plaintiffs turned around and sued for the removal of two fiduciaries on the retirement committee —an action based on the court’s ruling that noted that the two individuals lacked the capabilities needed to effectively oversee the plan.